How do we make deep connections with land, with ourselves and with each other? How do we resolve conflict and make difficult decisions? Inspired by Aboriginal wisdom and with a beautiful backdrop of Australian landscape, Deep Listening learns what makes communities work and shows the path to a more harmonious way of being. This is one of the secrets of life, no less. It really could change the world if people could just listen. 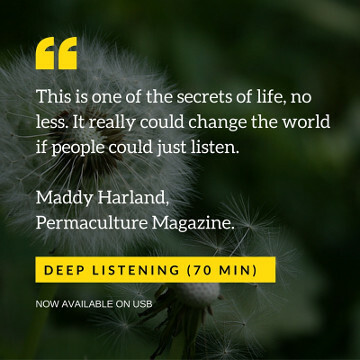 Deep Listening is currently only available as a part of 3-in-1 USB Box Set, along with the 2 other documentaries in this series, Ecovillage Pioneers and Lammas. To buy the Box Set, please use the Paypal button on the left. Beautifully shot against the rich diversity of the Australian landscape, Deep Listening interviews inspiring leaders in alternative culture, and Aboriginal elders share their own wisdom on the indigenous way of dadirri or deep listening - a profound connection to self, land and people. Featuring well-known lifestyle activists such as David Holmgren, John Seed and Robin Clayfield, Deep Listening draws a fascinating portrait of the people who have created the diverse communities that have thrived across Australia over the last 40 years. With ponderous pauses and moments of silent observation, the film itself is a meditation on the meaning of deep listening.